The payments company said Monday morning that it is not funding the production of Shakespeare in the Park shows, rather productions at the Public Theater only. Meanwhile, fellow sponsor The New York Times is sticking with its patronage. 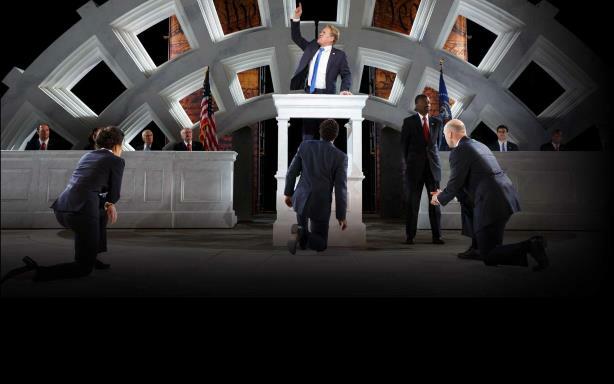 NEW YORK: American Express said Monday that it does not condone the Public Theater’s Shakespeare in the Park rendition of Julius Caesar that depicts the title character as a lookalike of President Donald Trump. The Public Theater lists American Express as a corporate partner on its website. However, American Express clarified via email that the relationship only extends to productions at the Public Theater. "We would like to clarify that our sponsorship of the Public Theater does not fund the production of Shakespeare in the Park nor do we condone the interpretation of the Julius Caesar play," the company said, via email. Delta Air Lines and Bank of America pulled out of their sponsorships on Sunday as criticism intensified of the production, which features a blonde, Trump-esque version of the play’s title character. Delta, the first corporation to rescind its support, was a four-year sponsor of Shakespeare in the Park. "The Public Theater chose to present Julius Caesar in a way that was intended to provoke and offend," Bank of America said on Twitter on Sunday. "Had this intention been made known to us, we would have decided not to sponsor it. We are withdrawing our funding for this production." Delta also tweeted its statement on Sunday that the "graphic staging" of Julius Caesar does not reflect the airline’s values. "Their artistic and creative direction crossed the line on the standards of good taste," the airline tweeted. "We have notified them of our decision to end our sponsorship as the official airline of the Public Theater effective immediately." However, another sponsor, The New York Times, is sticking by the show. "We have sponsored Shakespeare in the Park for 20 years," a New York Times spokesperson said via email. "As an institution that believes in free speech for the arts as well as the media, we support the right of the Public Theater to stage the production as they chose." The Public Theater said via email that it stands behind its production of Julius Caesar. "We recognize that our interpretation of the play has provoked heated discussion; audiences, sponsors, and supporters have expressed varying viewpoints and opinions. Such discussion is exactly the goal of our civically engaged theater; this discourse is the basis of a healthy democracy," the organization said, via email. "Our production of Julius Caesar in no way advocates violence towards anyone. Shakespeare's play, and our production, make the opposite point: those who attempt to defend democracy by undemocratic means pay a terrible price and destroy the very thing they are fighting to save." Eric Trump praised Delta and Bank of America’s decision in a tweet on Monday morning. Donald Trump Jr. also voiced his disdain on Twitter about the production. This story was updated on June 12 with comment from the Public Theater.